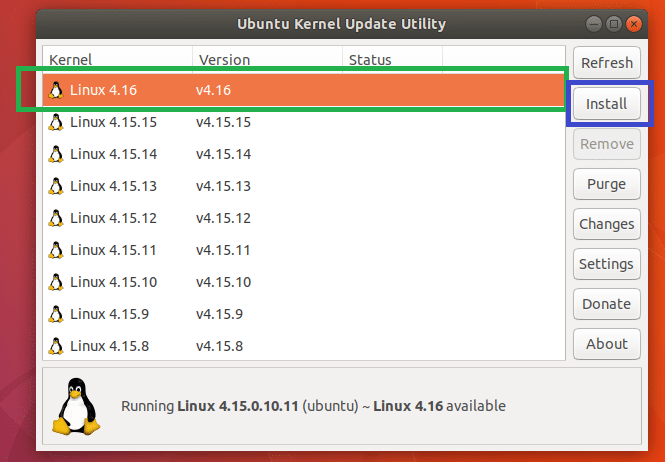 On Ubuntu operating systems, Ubuntu Kernel Update Utility (UKUU) is used to manage and update kernels. UKUU has a graphical and a command line frontend. It is really easy to use. 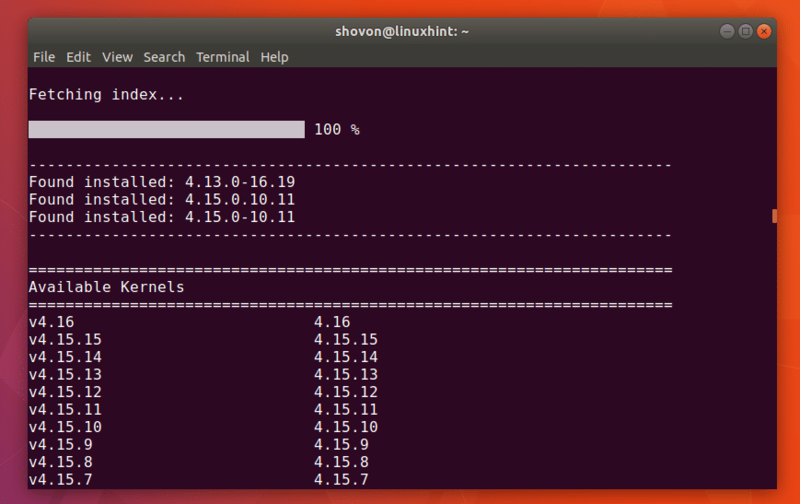 In this article I will show you how to update the kernel version on Ubuntu 18.04 LTS codename Bionic Beaver using UKUU graphically and through the command line. Let’s get started. It’s a good idea to check the kernel version you’re using before performing kernel update. So you will be able to find out whether the kernel update worked. 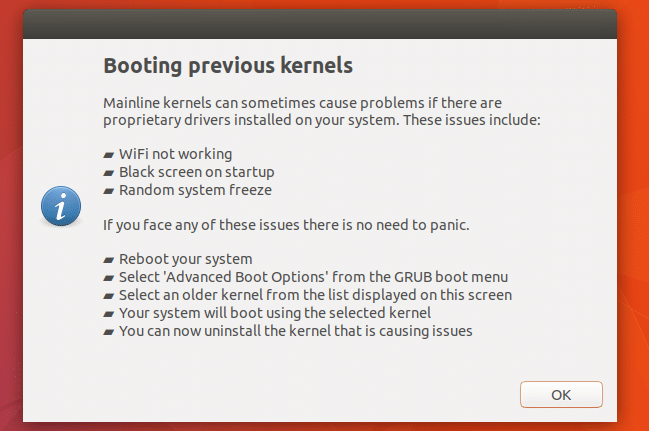 As you can see, I am using kernel version 4.15 right now. You can also see that I am using Ubuntu 18.04 Bionic Beaver. It’s in development as of this writing. But it should be released this month. 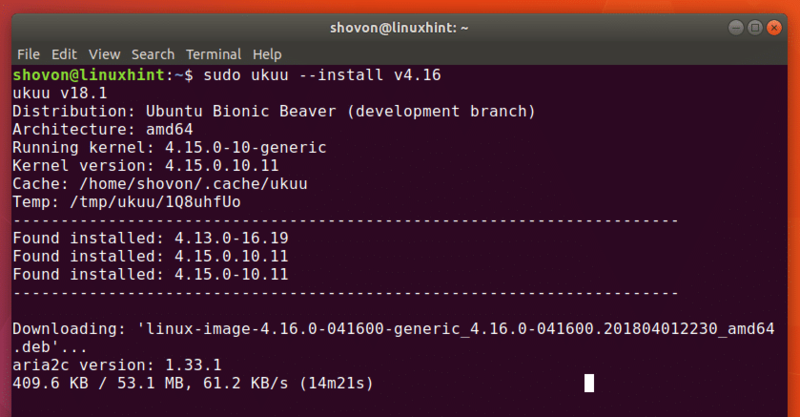 Ubuntu Kernel Update Utility also known as UKUU is not installed on Ubuntu 18.04 Bionic Beaver by default. 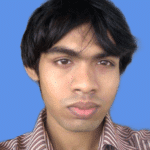 It is not available in the official package repository as well. But it is available on UKUU PPA. Once you run the command, UKUU PPA should be added as you can see in the screenshot below. As of Ubuntu 18.04, adding a PPA will also auto update the package repository cache. You won’t have to run sudo apt-get update manually anymore. It is a great feature to have. UKUU has a graphical application to update the kernel of Ubuntu 18.04 LTS operating system. 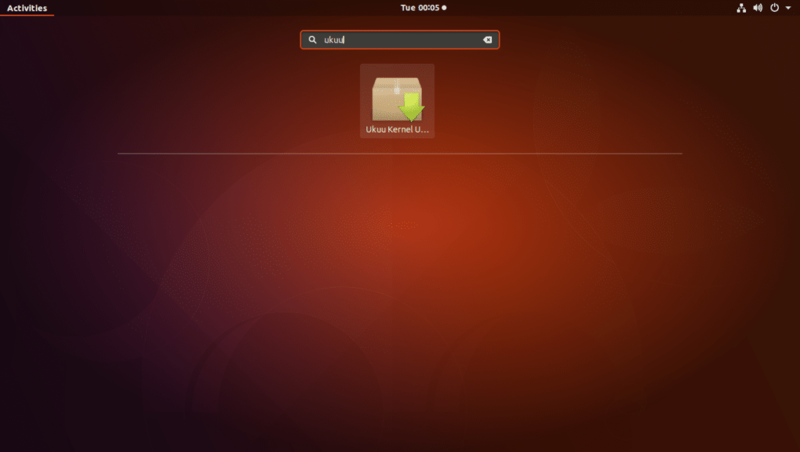 To start UKKU Graphical User Interface (GUI), go to the Application Menu of Ubuntu 18.04 LTS, and search for ukuu. Now click on the UKUU icon as shown in the screenshot below. You should see the following window. UKUU is generating a list of all the available kernels. Once all the kernel information is downloaded, you should see the following window. 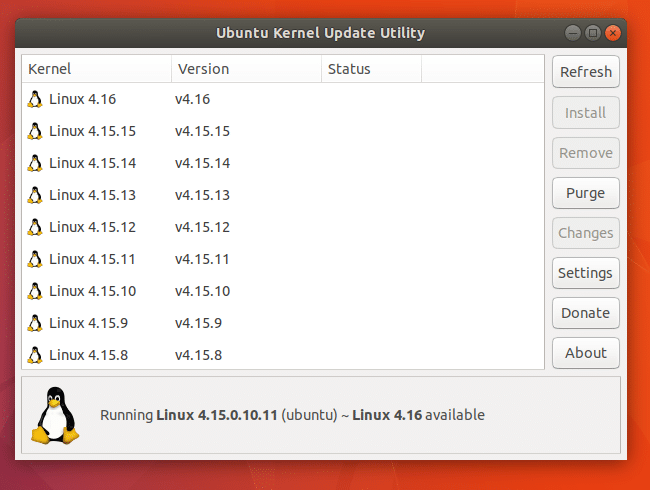 As of this writing, the latest version of the kernel is 4.16. You can of course select any version you want. I am going to install the latest version 4.16. So I will select that. Once you select your desired version, click on Install as marked blue in the screenshot below. Now enter your password and click on Authenticate. UKUU should start downloading and installing the new kernel. Once it’s done, click on Close as marked in the screenshot below. UKUU may give you a warning like this. Simply click on OK as this is the only thing you can do. Now restart your computer for the changes to take effect. As you can see from the screenshot below, the kernel is updated to the latest version. 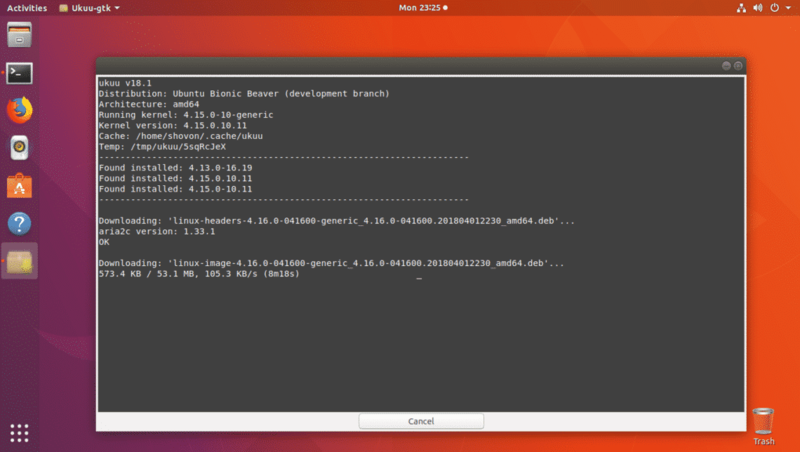 UKUU also has a command line utility which you can use to update the kernel of your Ubuntu operating system. The reason why you might want to use the command line utility is that it is more stable that the GUI version of UKUU. 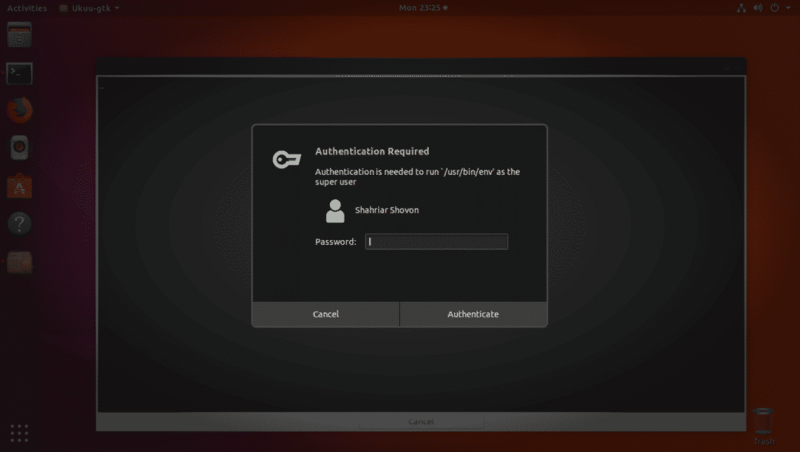 Also if you’re using a headless Ubuntu Server or Ubuntu without graphical user interface, then you can’t use the UKUU GUI even if you want to without installing several gigabytes of GNOME dependencies, which is really unnecessary. 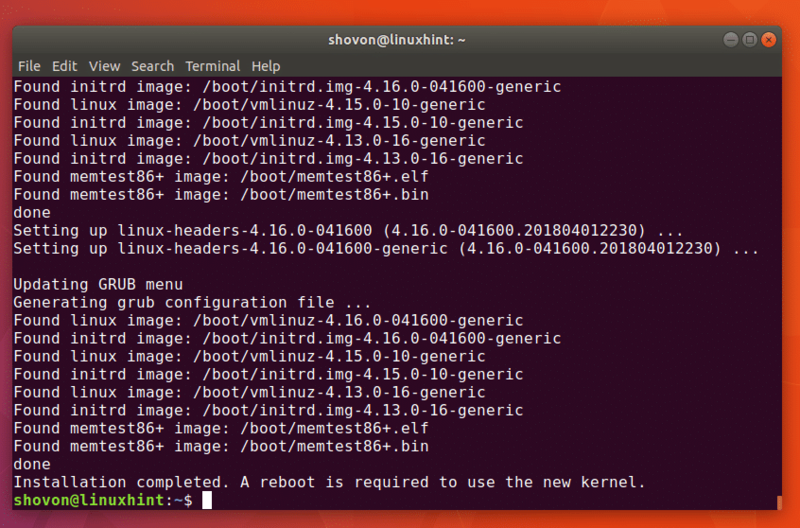 You can use UKUU command line utility on Ubuntu headless servers. I personally prefer the command line utility. 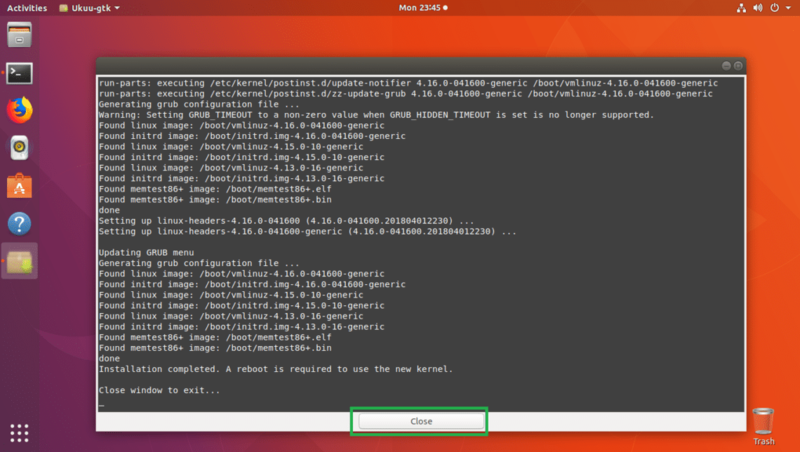 In this section I will show you how to use the UKUU command line utility to update the kernel of your Ubuntu 18.04 machine. UKKU should list all the available kernels as you can see in the screenshot below. I am going to install v4.16 kernel using UKUU. The access control should be disabled. UKUU should download and install the new kernel as you can see from the screenshot below. The kernel v4.16 is installed. As you can see the kernel is updated. That’s how you upgrade the kernel on Ubuntu 18.04. Thanks for reading this article.